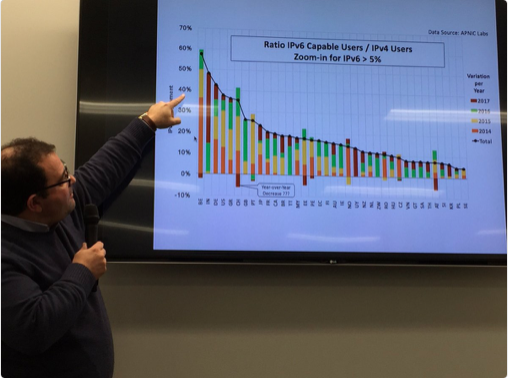 Alain Durand, Principal Technologist at Internet Corporation for Assigned Names and Numbers, visited Georgia Institute of Technology last week for a talk on the global adoption of Internet Protocol version 6 (IPv6). 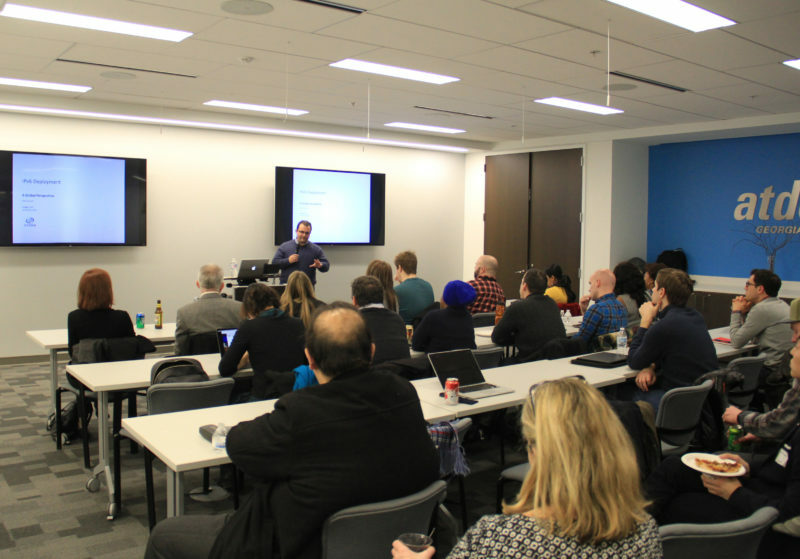 The Internet Governance Project organized the talk in cooperation with Atlanta’s Technology Development Center (ATDC) and the Institute for Information Security and Privacy. We are now more than twenty years into that prolonged transition. Looking at various sources of IPv6 adoption data, Durand’s presentation made it clear that some countries, e.g., the US and India, are pushing forward at a good rate. In those countries and some others the data optimistically reveals adoption rates between 20% and 40%, some with upward trends. But of concern are other countries that have 1) either not even started adopting, or 2) are plateauing at low levels not typically seen in new technology adoption. Among other curiosities, the data shows low adoption in places where one might expect substantial growth (e.g., Asia, northern Europe) and vice-versa (e.g., Greece is among the highest adoption in Europe). 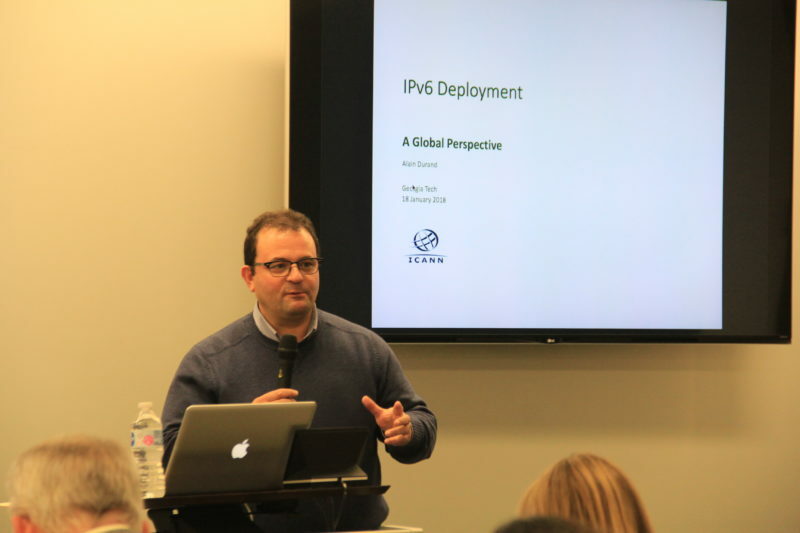 Durand suggested that, despite bridging technologies like network dual-stacking and multi-protocol devices and sites, the network effects associated with IPv6 don’t seem strong enough to overcome the installed base of IPv4. Something else, or a combination of factors, must explain what we are observing. Understanding what these factors are is important. In Durand’s view, IPv6 is not being adopted globally nor at rates that are needed to promote Internet stability and prevent fragmentation. 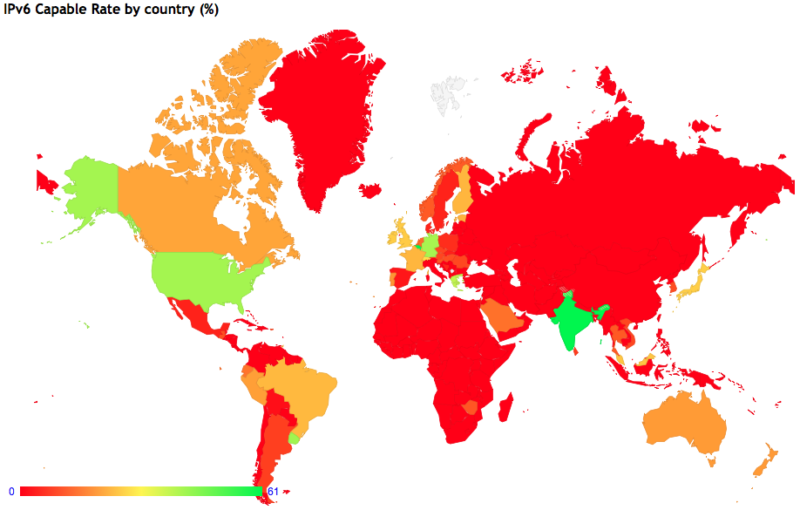 The observed imbalances could result in a situation where parts of the world with adequate IPv6 adoption decide to turn off IPv4, and lose connectivity to the rest of the world. The audience, a combination of GT undergraduates, faculty, and Internet entrepreneurs peppered Durand with a wide range of questions. How are we actually measuring IPv6 adoption (both capability and usage)? What are the market characteristics where IPv6 adoption is/is not occurring? What is the relationship with consumer and other devices? What government or other policies are being pursued, what impacts are they having? One intriguing line of questioning wondered if the transition should be framed at a high level as a collective action problem. This does make sense. Transition to IPv6 confers substantial benefits to certain actors (e.g., wireless operators need to support rapid mobile growth), therefore they are willing to invest in and migrate to the new protocol. Other actors, e.g., end users in areas where the Internet is developing, might receive very little benefit from migrating therefore leading to free riding. This suggests that, among other possibilities, strategically finding ways to increase the network effects associated with IPv6, along with targeted subsidies to certain actors might be a policy prescription that could encourage migration. But there is much more to learn. Having played a recognised role in raising IPv6 awareness among European Civil Society and Governmental entities, notably in France, between 1998 and 2005, it appears appropriate to vouchsafe the opinion that those pushing for IPv6 deployment towards the end of the 20th century made a key error in failing to push the strategic advantage of linking v6 with the concept of ubiquitous computing. This was well before the conception of the slogan of “Internet of Things” and everything associated therewith. 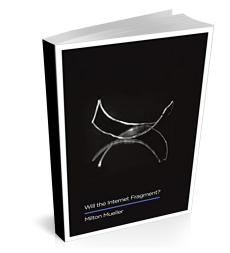 Indeed, IPv6 has not yet found its “killer app”, though IoT is one. Maybe they are not on the same hype wave!